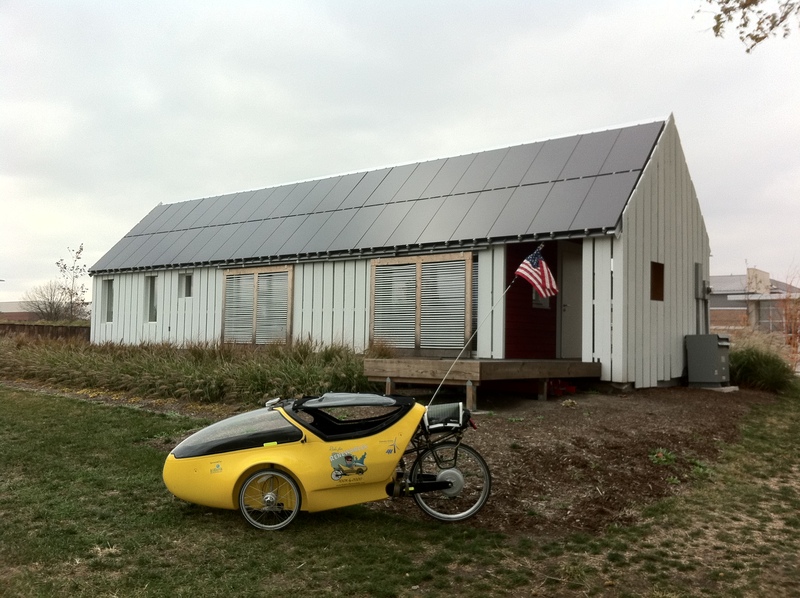 Spent the morning catching up on blogs and emails, then headed over to the University of Illinois campus in the afternoon to check out the 2009 solar decathalon house. Recruited Matt Childress to join me after work for a public talk by my old friend John Passacantando (former Executive Director of Greenpeace), who also happened to be in town for Sustainability Week. John gave a great talk, and also pitched my ride and online petition. Afterwards, I showed him the rocket trike and Matt took him for a spin in the TWIKE. Turns out John also loves bikes and actually used to work in a bike shop. The three of us later hit an Irish pub for some grub and drinks (thanks, John!) to share some stories from the past and lay plans for the future. This entry was posted in 2010 Ride, Blog and tagged passacantando, ride for renewables, sustainability week, twike, university of illinios. Bookmark the permalink.